What's for dinner tonight? On-trend flavors from around the world, made perfectly by Chef You. 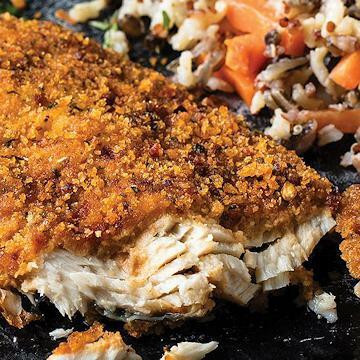 The main dish is our all-new Harissa-Encrusted Trout, rainbow trout fillets from Idaho perfectly breaded with a light and crispy crust made with North African harissa seasoning (dubbed "this year's Sriracha by Time Magazine). On the side... superfood! Our Five-Grain Rice Pilaf features brown and wild rice, quinoa, black barley, carrots, and onions in a powerful and healthy flavor explosion. And the best part is... it's all easy to make. Eat right tonight! Do not thaw. Fish must reach an internal temperature of 145�F prior to eating. Appliances may vary, adjust accordingly. Oven: Preheat oven to 425�F. Remove fillets from packaging and place on baking sheet. Bake for 16-20 minutes or until fish is opaque and flakes easily. (Additional browning may be achieved by finishing under broiler). Pan Saut�: Heat 2 tablespoons of oil in saut� pan over medium heat. Remove fillets from packaging and saut� fillet skin side up for 2-3 minutes. Turn fillets and cook 8-10 minutes or until fish is opaque and flakes easily. Ingredients: Idaho Rainbow Trout, Wheat Flour, Soybean Oil, Water, Modified Corn Starch, Flavor Bits (Corn Syrup, Corn Flour, Corn Cereal, Palm Oil, Natural Flavor, Fruit And Vegetable Juice, Extractive Of Paprika, Caramel Color), Spices, Red Bell Pepper, Yellow Corn Flour, Salt, Sugar, Contains Less Than 2% Of: Garlic, Ancho Chile Pepper, Yeast And Yeast Extract, Leavening (Sodium Acid Pyrophosphate, Sodium Bicarbonate), Dextrose, Paprika, Parsley, Natural Flavor, Maltodextrin, Tomato Powder, Paprika Extract, Citric Acid. Contains: Fish (Trout), Wheat, Soy.